This slow cooker version of one of the most popular Bridge recipes of all time is just as easy and just as delicious as the classic. And (sacrilege!) we’ve phased out the can of cream of tomato soup. But not to worry, we’ve also included instructions on doing it the much loved, old-fashioned way if you’d still like to use the tomato soup. In a large skillet, heat a drizzle of oil over medium-high heat. Add beef and cook, breaking it up with a spoon, until starting to brown. Add onion and cook, stirring, until beef is browned and onion is softened. Scrape into a 4- to 6-quart slow cooker. Stir in carrots, celery, bay leaf, barley, sugar, cornstarch, salt, pepper, tomatoes, stock, water, tomato sauce and soy sauce. Cover and cook on low for 6 to 8 hours. Discard bay leaf. 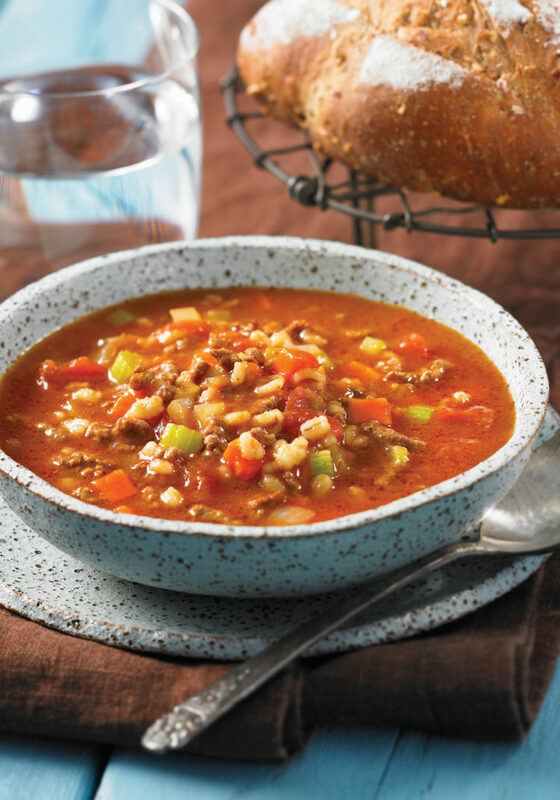 Tip: Hamburger soup freezes like a dream! If you’re serving a family of 4 or 5, let half the soup cool after cooking and ladle it into a freezer bag. Pull it out of the freezer and pop it in the fridge in the morning, and it will be thawed in time for dinner. Pour into a soup pot and reheat. Tip: If you insist on doing it the old-fashioned way, omit the sugar, cornstarch, beef stock, tomato sauce and soy sauce, and replace them with three 10-oz (284 mL) cans of beef consommé and one 10-oz (284 mL) can of tomato soup. Posted in Book Recipe A-O, Recipe Index, Soups, Salads & Dressings. ← Our Family Slow Cooker Book Tour! How many calories would be in a serving of the soup? Is one cup the serving amount? Also, I made it the old fashioned way before and it was amazing. With these other changes, is the taste different? We do not have a nutritional breakdown for our recipes. Our current recipe is similar in taste but does not exactly duplicate the original, but we hope you’ll love this version just as much! One serving is approximately 1 cup. Best of Bridge is more than just a company – it evokes all the goodness of home cooking and that wonderful feeling of family, friends and comfort. Bridge recipes are staples at dinners and celebrations across Canada and many recipes are now part of family traditions because the recipes are always soul-satisfying, dependable, and above all, delicious.